When I write about a car I see listed for sale, I'm taking the word of the seller that he or she is describing it accurately. I can't go look at every car, as much as I'd love to (and I would really love to). 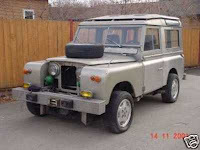 Last week I spotted that Land Rover / Citroen / Nissan / Jaguar thing listed on eBay. I thought it was an interesting vehicle and decided to write about it. The seller stated "The car has been driven in its current state for about 25,000 miles so all of the little bugs have been worked out" and "Vehicle has not been driven for past 8 years. Has only moved 50 feet to another storage spot. Vehicle is all intact and parts accounted for". OK, I can relate to that. Back in the mid 1980s I bought a 1976 Alfa Romeo Alfetta GT. My friend and Alfa mechanic extraordinaire, Jeff Greenfield, spotted it at an auto body shop. 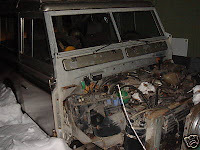 The body had been restored (it was very well done, except for the paint, which was thin), but the engine was shot. I had an Alfetta sedan at the time which had a good engine but a tired body. Jeff told me about the GT and since it made sense for me to put my engine in that car, I bought it. It started out as a simple engine swap, but when Jeff and I get involved with a car nothing seems to be simple. I wanted to put a pair of Webers I owned on it and Jeff told me it would need different cams for that. OK, new cams it is. My sedan had an amazingly good transaxle with a new clutch, so the decision was made to put that in the GT, too. The GT's shocks were tired, so we ordered some Bilsteins. Well, heck, as long as we were under the car we might as well lower it, too. A new set of Shankle springs were ordered and Jeff turned the torsion bars. While Jeff was doing all this I saw a rusty 1979 Alfetta GT in someones yard during a trip to Rhode Island. I knocked on the door and was told I could have it for $200.00. I bought it. The '79 had air conditioning and a leather interior. Hmmmm... It gets hot in the summer and leather seats really look good, so I decided that the A/C and interior needed to go into my car. (Jeff was less then thrilled about retro-fitting A/C into a car that didn't have it before, but he managed to do it and the A/C worked like a champ. He lost about a pint of blood during the ordeal though.) 8 months later, the car that was going to be a "two day engine swap", finally hit the streets. It was a great car to drive. Alfa introduced the Milano to the US in late 1986. As soon as I saw one I knew I had to have one. In late 1987 I bought one. The Alfetta, although still fun to drive, was driven less as I fell in love with the Milano. I soon purchased an Alfa Spider and the Alfetta was driven even less. By the early nineties I had permanently parked it in the garage and took off the plates and insurance. In 1999 my significant-other and I split up. She got the house, but we reached an agreement whereby I could keep two of my cars in what was now her garage for a "short period of time", so the Alfetta stayed there and the Spider was parked there during the winter. "Short period of time" is a relative term. I've heard it said that "we are only on this planet for a short period of time", so I figured I had lifetime auto storage. My ex saw it differently. 6 years later we made a new deal, and while I was allowed to keep the Spider in the garage for another year, the Alfetta had to go ASAP. I put it up for sale. In the ad I stated that the car looked good, but hadn't moved in many years. A guy from Vermont came to look at it. We pushed it out of the garage and into the driveway. Seeing it in the sunlight, I can honestly say that except for a thick layer of dust and some mouse droppings, the car really did look as good that day as it did when I pulled it into the garage for the final time. We even got it to run after putting in a new battery and creating a direct to carburetors "fuel cell" out of a plastic milk container. The car was sold and trailered to Vermont that day. Which brings me back to the Land Rover / Citroen / Nissan / Jaguar thing. I checked on it last night to see what it sold for. It didn't sell. The high bid was $1500.00, which didn't meet the reserve. $1500.00 is nothing for a vehicle like that, I thought. Yes, it's a freak, but you'd have thought there would be have been a few people out there who appreciated the time and engineering that went into it enough to bid on it and pay what it's worth. Look at the picture below. It has a date stamp of 2001, but even after 8 years in storage it probably only needed a few weekends worth of sorting and a really good cleaning, right? Now look at this picture below. This is what the vehicle really looks like these days. This picture (and a few others showing a very incomplete interior) were added a few days after the auction started. The "storage spot" is, apparently, outside, in the snow. The front sheetmetal, which appeared to be on the vehicle in the original pictures, is gone or at least no longer attached to the vehicle. All of a sudden $1500.00 seems like a pretty fair price. When buying and selling a car there will always be certain inevitable differences of opinion about the condition. A good paint job to one person might be a crap one to another. Replacing a clutch might be minor work to some people and not to others. But this vehicle needs a lot more than we were led to believe from the way the ad was originally written. There is no difference of opinion there. I'm not accusing anyone of doing anything intentionally wrong here. I also would assume that anyone bidding on this vehicle would have asked the seller a million questions before bidding (I suspect that's what eventually led to the updated pictures) and knew what it was they were getting. I can imagine the excitement someone looking for a vehicle like this felt when they saw the original listing. I can also imagine the disappointment they felt when they found out what condition it was really in. I've been there a few times myself. eBay can be an amazing tool for buying and selling cars, but only if the sellers are upfront about the vehicle (and, to be fair, buyers are reasonable in their expectations). I remember the ordeal of building you one working car out of three although parts of the memory are fuzzy. I'm not sure didn't the black 79 Alfetta GT come first? I vaguely recall that car having the rare 3 cylinder engine and/or 4 speed transmission option. I seem to recall having that car running with the drivetrain from the sedan, and then moving it to the Blue car later? Somewhere through this project We took the factory air out of the '79 and put it in the '76. That was an interesting and challenging feat. I think we also swapped the dash too.